Donald Trump expressed a willingness to meet with Kim should he visit the United States. President Donald Trump said Monday he would be "honored" to meet with North Korean leader Kim Jong Un "under the right circumstances." 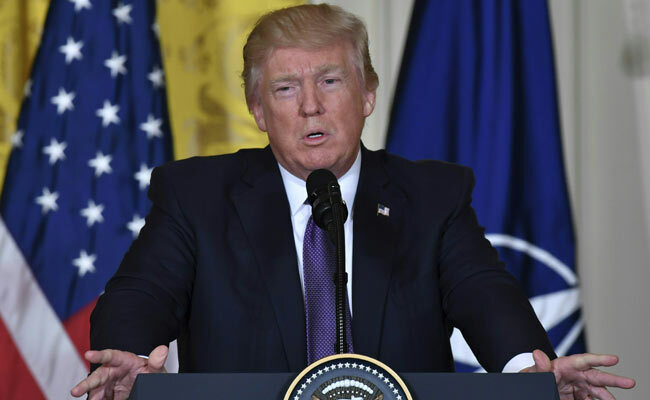 Trump's comments came amid heightened tensions with North Korea, whose nuclear weapons program has sparked deep concerns in the international community, and just a day after Trump said he would not rule out military action against North Korea. "If it would be appropriate for me to meet with him, I would absolutely, I would be honored to do it," Trump told Bloomberg News in a Monday interview. "If it's under the, again, under the right circumstances. But I would do that." The president acknowledged that his willingness to meet with a dictator known for oppressing his people - comments that are sure to spark an outcry from everyone from diplomats to the human rights community - was more than a little unconventional. "Most political people would never say that," Trump said in the Bloomberg News interview, "but I'm telling you under the right circumstances I would meet with him. We have breaking news." The president has a history of praising, and even seeming to admire, the strongmen dictators who more typically earn international condemnation that begrudging respect. His relationship with and seeming fondness for Russian President Vladimir Putin dogged his campaign and now continues to distract in his administration. And Trump hosted Egyptian President Abdel Fatah al-Sissi at the White House last month, despite Sissi being barred from the White House under President Barack Obama, after coming to power through a military takeover. On Saturday, he invited Philippine President Rodrigo Duterte to visit the White House, despite the leader's controversial war on drugs that has resulted in the deaths of thousands of Filipinos. The president has also praised Kim before. In an interview with CBS's "Face the Nation" on Sunday, Trump said Kim was "a pretty smart cookie" because "at a very young age, he was able to assume power." "A lot of people, I'm sure, tried to take that power away, whether it was his uncle or anybody else," Trump said on the Sunday show. "And he was able to do it. So obviously, he's a pretty smart cookie." Kim had his uncle executed in 2013. He is also widely believed to have had his half brother assassinated in February. And during the campaign, Trump expressed a willingness to meet with Kim should he visit the United States, saying, "What the hell is wrong with speaking?" "I wouldn't go there, that I can tell you," Trump said a campaign rally in June. "If he came here, I'd accept him. But I wouldn't give him a state dinner like we do for China and all these other people that rip us off."